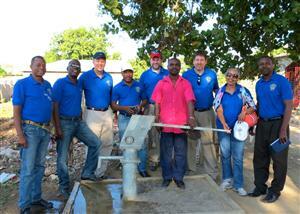 On April 6, Granville Rotarian Donald Jones joined representatives from the Worthington AM Rotary Club and the Rotary Club of Ouanaminthe, Haiti in dedicating eight water wells in Ouanaminthe and its surrounding villages and countryside, an area where clean and safe drinking water is an incredible need. The dedication of the wells was the culmination of a two year journey during which the clubs obtained Rotary District 6690 and Rotary International grants to make this achievement possible. To insure the sustainability of the project, the Rotary Club of Ouanaminthe identified a local committee for each well which will be responsible for its safety and maintenance. With this local oversight, these eight wells will provide clean, safe water for years to come. Additionally, because the project came in under budget, it was anticipated that the remaining funds would be used to repair two additional wells. During the visit, the three clubs discussed future opportunities for collaboration around issues of clean water, environmental education and sustainable food practices, and are looking forward to future projects.